We’re one of the UK’s leading suppliers of inverter generators and we have a wide range for sale from leading manufacturers like Hyundai. Our extensive range of inverter generators includes options for any professional, domestic and outdoor needs. This range are particularly useful for supplying power when caravanning and camping as they are lightweight and silent when in use. We also appreciate that everyone has different usage needs, which is why we put together our ‘Generator Selection Guide’. This can explain which inverter generator would be right for your circumstances and can advise on everything from which generators are the best for camping to which compact portable models suit busy working environments. However, with a wide range of different wattage and power capacities available, there’s sure to be an inverter generator that’s right for you from our selection. What are the Advantages of Using an Inverter Generator? The main benefits of inverter generators are that they feature fuel-efficient motors and that they produce a low level of noise. These generators are also safe, reliable and easy to move around, so much so that they are sometimes referred to as ‘suitcase’ generators. Our models are particularly useful and easy to move as they can be picked up with their convenient top handles. With SGS Engineering you can browse our online selection of inverter generators and place an order today. Check if you qualify for free next working day delivery. We are also committed to manufacturing excellence and have our 60 day returns policy in place. As well as this, all our inverter generators are under warranty. The individual policies can be found on each product page and you can see all our warranty options here. 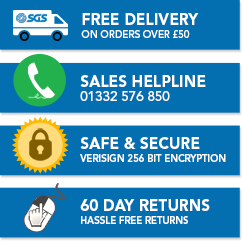 If you have any questions about any of the inverter generators we supply, or you need more advice regarding which models are the best generators for caravans and camping, then you can get in touch via email sales@sgs-engineering.com or phone 01332 576 850. To help make sure you always find the right inverter generator we’ve created some advice pages you can use to learn more about everything from generator maintenance to generator assembly. - Make sure your power is backed up with your generator. - Find out how to charge batteries with your generator.